Need to stretch your apps budget? 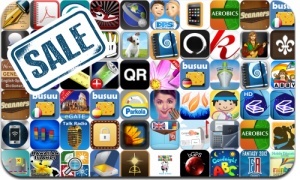 Here are 57 iPhone, iPad and iPod touch apps that just went on sale. This app deal alert includes Hyperlight, Silversword, On The Wind, FaceGoo, Laminar, PhotoForge2, QR iScanner, Safety Note+, Battery Doctor, PDF Reader, Phone Drive, Knowtes, Busuu Travel Courses, and many others.